A powerful, next-generation web design application created to help you design professional and good-looking web sites in minutes. RapidWeaver helps you start the website creation process with multiple page types and formats, which include photo albums, contacts forms, blogs and sitemaps. You just need to select the page type, a theme and add your content to the project. All of this can be made without writing even a single line of code. RapidWeaver comes with more than 40 different website themes that you can switch to at any given time. They are changed instantly, so you can easily see how your website looks with any theme in a snap. After you finish the website, you can easily upload and publish it from the comfort of your desktop. The application includes a project window where you can keep your projects, but also add handy links, which you need to access when working on a website. On top of that, you can manage your bookmarks in a snap, if you want to. 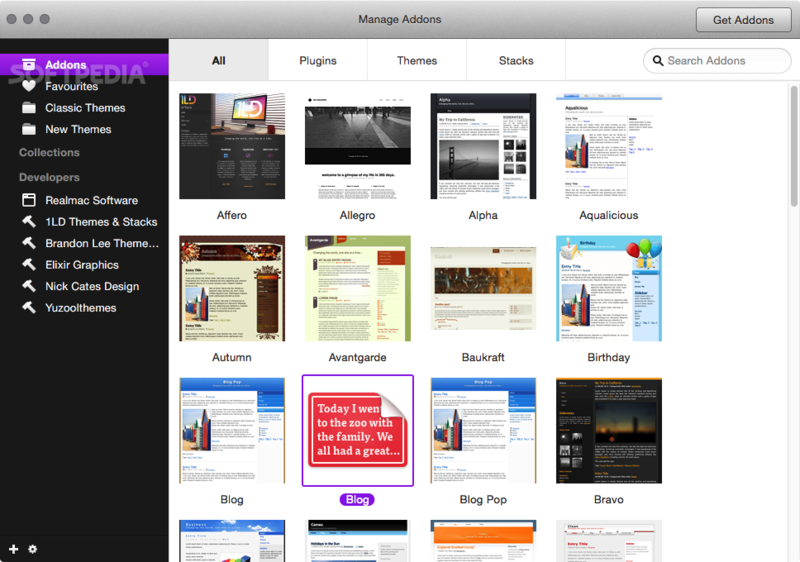 RapidWeaver makes it easier for you to add resources to a website at any time. In addition, with the help of the One Click Publishing feature you can export and upload all the changes to your website. The tool also allows you to organize the website themes and includes a refined user interface, that guides you through all the steps you need to perform in order to successfully create your website. Furthermore, RapidWeaver allows you to track website statistics from within the application, generates a site map and it even provides multiple web development tools.